There was some near-record heat in Los Angeles this weekend and, even though it’s cooling down a bit now, it was the first time this year that I really felt like summer was upon the city. In some ways, I’m not looking forward to the heat of summer because as much as I dislike being cold, it’s a bit tough on those 110F+ days. Mostly, I like the heat. I don’t have a problem running my oven because my kitchen is well ventilated, breads rise very quickly and I get to make lots of homemade frozen treats. I also get to make some cold, refreshing drinks to keep me going. Coffee drinks are – and quite possible always will be – my drinks of choice, but I can’t resist a good smoothie or root beer float, either. One drink I particularly like is a lassi. A lassi is a traditionally Indian drink that is made with yogurt and a variety of spices, sweet or savory. I’ve noticed that fruit lassis are probably the most popular and are easily the most widely available type at the Indian restaurants I’ve been too. They are often smoothie-like in consistency and use yogurt, milk, fruit and a sweetener. I believe that more traditional lassis have a thinner consistency than the milkshake-like variety. I prefer the thinner type because, to me, it is more complimentary to a meal, while a very thick drink will fill you up before you take more than a few bites of food. 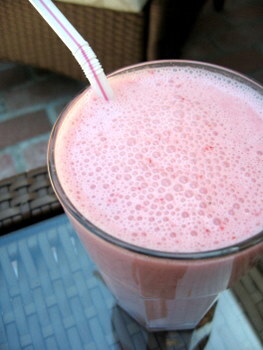 I used plain yogurt and fresh spring strawberries for this lassi, and added only a bit of honey as a sweetener. I find that plain yogurt has a really nice tang that makes the drink very refreshing. I actually used thick Greek-style yogurt here and still found that the consistency of my drink was not too thick. The consistency will vary slightly based on the type of yogurt used. If you prefer yours thinner, simply add a bit of milk or honey. Conversely, if you prefer yours to be thicker, add more yogurt or berries. Process in food processor until no chunks of ice remain and drink is very, very smooth. would a blender be ok to use?